SOLANA BEACH — About a dozen dogs, big and small, were “paw” for the course at the sixth Foundation for Animal Care and Education golf fundraiser on Nov. 13 at Lomas Santa Fe Country Club. FACE, as the nonprofit organization is called, saves pets that would have otherwise been euthanized because their owners could not afford expensive live-saving procedures. Since its inception in 2006 by a group of veterinarians and community members, the foundation has provided about $3.3 million in grants to save about 1,915 animals. 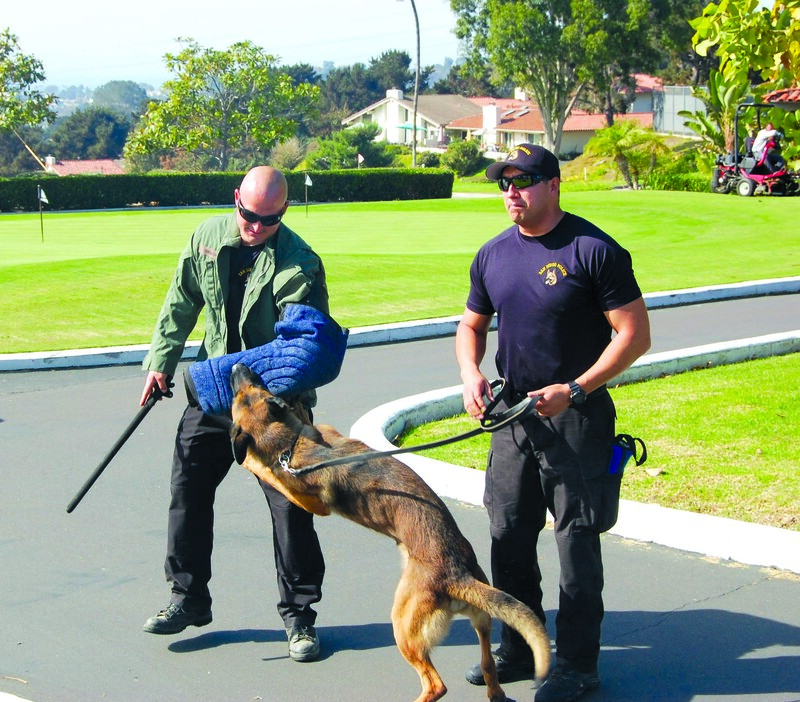 Atos and San Diego police officers Carlos Estrada, right, and Nathan Whann participate in a canine bite demonstration. 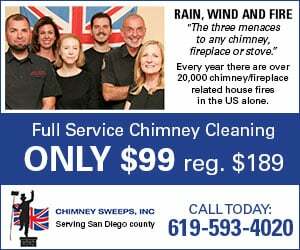 According to the San Diego Animal Welfare Coalition, from July 2014 through June 2015, 1,134 animals deemed “treatable” were euthanized. That total does not include the number of treatable pets put to sleep in veterinary hospitals. FACE works with more than 130 veterinary hospitals throughout San Diego County that discount their services by at least 25 percent for qualified patients. 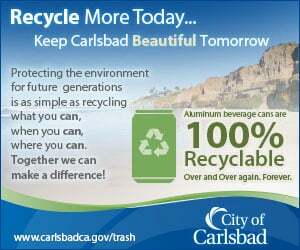 The golf tournament began in 2008 at Del Mar Country Club, then resurfaced in 2013 at Lomas Santa Fe. This year there were 88 golfers registered to play, plus three professional athletes who tried to play at least one hole with each foursome throughout the day. 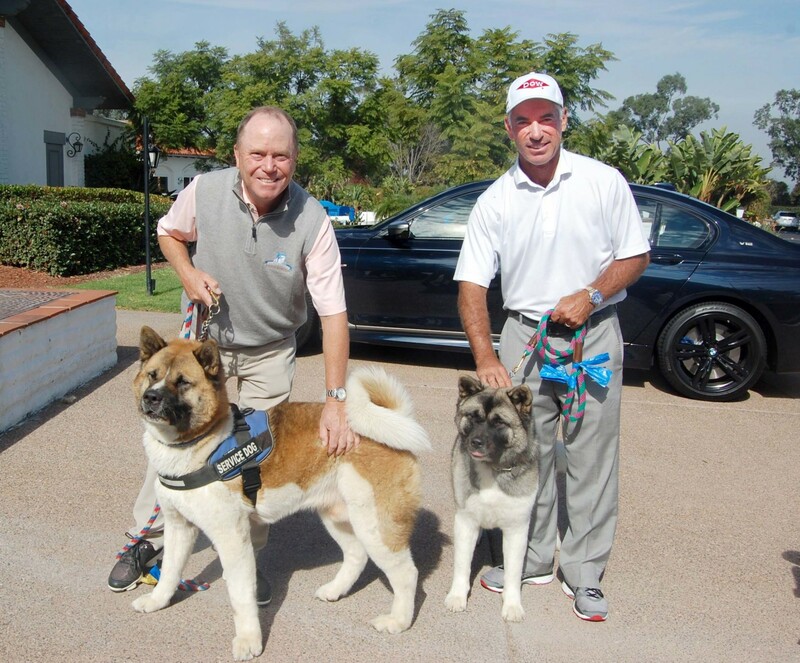 “That way we get to say hello to everyone and thank them, and they get, I guess, the ‘opportunity’ to play with us,” said PGA golfer Corey Pavin, who became involved with FACE because helping animals is a cause that’s close to his heart. Also roaming the course was PGA golfer Jeff Sluman and Major League Baseball’s Fred Lynn. 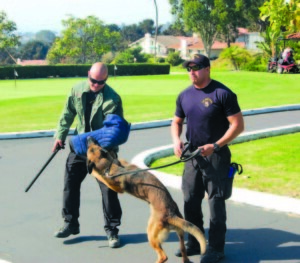 Before participants hit the course, San Diego Police officers provided a K-9 bite demonstration. Carlos Estrada said department dogs go through eight to 10 weeks of training at an academy. Those that pass “raise a paw and get sworn in,” he added. Those that don’t are used as detective dogs. Police K-9s are used only under specific circumstances, such as when a suspect is violent or armed or has access to a weapon. During the demonstration, Officer Nathan Whann wore protective equipment on his arm and held a stick. With his dog, Atos, on a leash, Estrada commanded Whann to drop the “weapon” and warned him he would release the dog if he did not comply. When Whann didn’t, Atos went into action. “I don’t even feel it,” Whann said after the demo, adding that when the K-9s aren’t “working” they are like normal dogs. “My kids play with him when I take him home,” he said. Most K-9s work until they are 8 1/2 years old. Officers can buy them for $1 because, Whann said, the department can’t give away equipment. He also said injuries to police dogs are rare. The tournament was followed by “yappy hour” that included drinks, appetizers, desserts, an awards ceremony, a raffle and a live auction that featured donated prizes such as VIP courtside Lakers tickets, luxury travel packages and more. Guests also vied for the “Dream Ticket” opportunity drawing, made up of golf outings at more than 10 of the best golf clubs in Southern California. Brooke Haggerty, FACE’s executive director, said the goal was to raise at least $125,000. She said all money raised is profit because everything associated with the tournament is donated. While the fundraiser focused on canines, FACE saves all animals. Cats have yet to participate in the golf tournament but if allowed, they would likely be shooting for birdie.